After submitting an eTariff filing and before FERC takes action on it, you may withdraw the entire proceeding by submitting a withdrawal-type filing. In this article I will describe the characteristics a withdrawal-type filing and outline the steps to take in TariffShark in order to prepare one. The purpose of a withdrawal-type filing is to withdraw an entire proceeding before FERC has taken action on it. In order to indicate to the Commission which proceeding is being withdrawn, a withdrawal-type filing must be associated with an earlier, already-submitted eTariff filing. Also, a withdrawal-type filing does not propose changes to tariff language, therefore, it will never contain Tariff Record Versions or FTRVs. Finally, like all other eTariff filing types, a withdrawal-type filing must include a Transmittal Letter which describes the nature of the submittal. Follow the steps below to prepare a withdrawal-type filing. The list is intentionally brief and does not go into great detail. If you have questions about the procedure, contact TariffShark Support. Create a withdrawal-type filing. The type of filing code to use depends on the FERC Program to which your company belongs. At the time of this writing, these are the FERC Programs and withdrawal-type filing codes. On the Update Filing window, enter the Validation Email address. For the Associated Filing field, click the ellipsis button and select the already-submitted filing you propose to withdraw. On the Filing Details window, on the FERC Attachments tab, update the Transmittal Letter attachment by uploading your transmittal letter. At this point, the filing is ready to go. You may wish to Validate it in TariffShark before downloading the XML and submitting the filing. In an earlier blog article, we described a method for submitting a tariff filing to FERC’s eTariff sandbox, which is helpful for users who don’t have TariffShark Hammerhead. We also posted a screencast that shows how TariffShark Hammerhead has built-in FERC sandbox submission. The purpose of this article is to help you diagnose why your computer may not be able to successfully submit a filing to FERC’s eTariff sandbox. 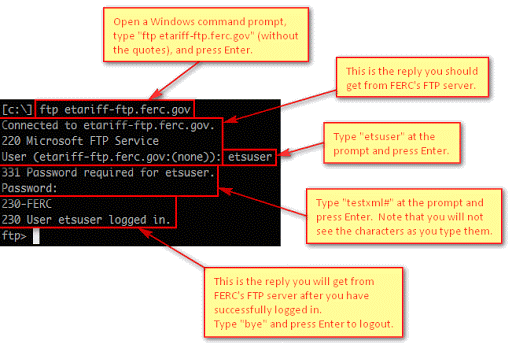 FERC’s eTariff sandbox is an FTP server. FTP is an acronym for File Transfer Protocol, which provides a means for sending and receiving files over the Internet. Some organizations have configured their corporate networks to block FTP, which also blocks the FERC eTariff sandbox. In addition, some desktop computers are configured to run a software firewall. A software firewall could also be blocking FTP. If a user is able to connect to FERC’s eTariff sandbox using the procedure above, then the problem is not one of blocked access and we will continue to dig deeper. If you have questions about using FERC’s eTariff sandbox or run into problems trying to submit a filing to the sandbox, we’d love to hear from you. Please comment below or contact TariffShark Support.